It's finally here: Hollow City, the sequel to Ransom Rigg's creepy, imaginative debut, Miss Peregrine's Home for Peculiar Children. Doesn't it feel like we've waited forever for this book? Those who haven't read the first in the series will want to go back and start at the beginning, as Riggs doesn't provide a lot of recap in the second volume (a welcome respite from other fantasy series that seem to spend the first 100 pages reminding you of what you've already read). 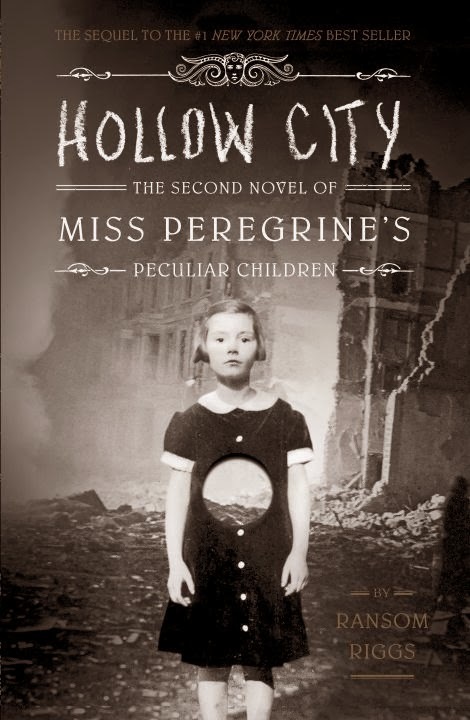 Those who haven't read the first in the series may also want to stop reading here, for while I promise not to spoil Hollow City, I can't promise not to spoil Miss Peregrine's. At the end of Miss Peregrine's Home for Peculiar Children, Jacob and his peculiar friends were left fleeing their small island in Wales, leaving behind the relative safety of their loop to try to save their Miss Peregrine, who happens to be stuck in bird form and cannot transform back into a human, and the fate of the peculiar world in one fell swoop. The gang comes across a menagerie of talking animals; dodges bombs in the London Blitz; and encounters more peculiars in, well, the most peculiar of places. Though the subject matter can sometime be a bit dark (there's something inherently terrifying about the Blitz, in my mind), the story is imbued with a kind of childish hope that keeps it from ever feeling too heavy. Jacob and Emma's romance evolves, and Jacob himself continues to question how--and if--he fits into this peculiar world. It's an interesting twist on the coming-of-age story, transporting a young teenager into a time and place that is not his own to force him to start questioning where he belongs, and it works. And, as we've come to expect from the ever-imaginative Riggs, Hollow City combines morbidly fascinating vintage photographs with a healthy dose of monsters, villains and superpowers to continue the story of Miss Peregrine's peculiar children. Hollow City ends on, yes, another cliffhanger, but the second volume in the Miss Peregrine series should leave no one doubting whether or not the wait will be worth it. I liked Miss Peregrine's, but wasn't sure I liked it enough to continue on with the series. But so many people have enjoyed the second installment that I might check it out one of these days. I like the idea of Jacob's coming-of-age taking place in this mysterious world. I found the second in the series really lived up to expectations - but then, I really enjoyed the first one! I'd re-read the first one relatively recently so I didn't have this problem - I would recommend going back and revisiting the first (at least a skim!) as Riggs really doesn't give much recap at all. I loved the photographs and general weirdness of the first book -- must remember to pick this one up at the library! I know! It's so creative. I'd love to see Riggs speak sometime and hear more about his process for these books. I'm sure it's fascinating. I finished the first one yesterday so it is good to read such a positive review of the second! Hopefully I can get my hands on it soon! I'm so glad this was good! Sometimes I think it's hard to follow up a crazy successful book with an equally great sequel. I'll have to get my hands on a copy.